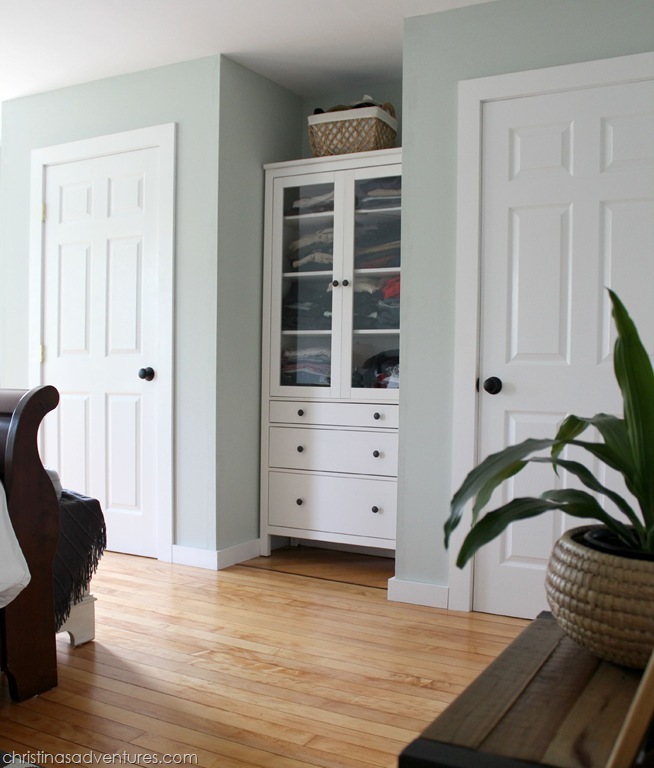 Beautiful master bedroom transformation – a dated 1902 Victorian house gets a makeover! 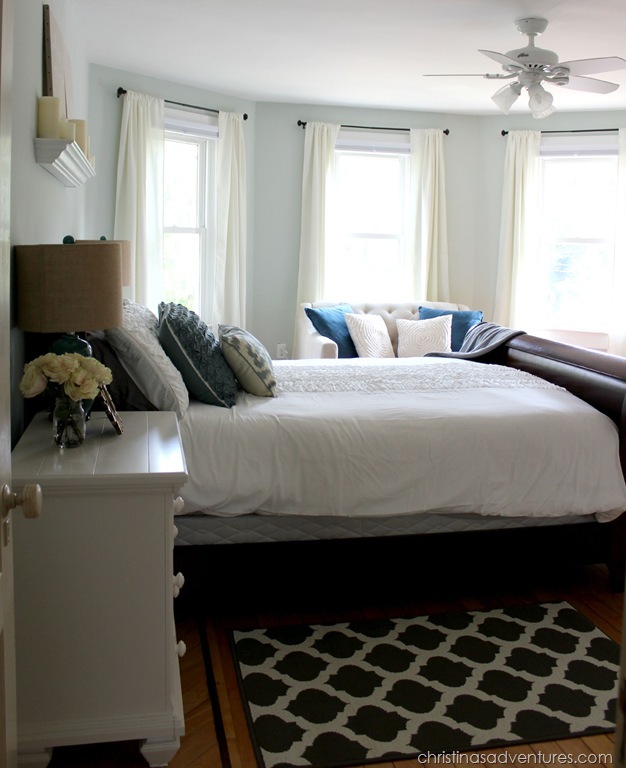 This bedroom is now light, airy, and romantic. This post contains affiliate links- full disclosure here. It’s been a little quiet here for the past month, but I’m back from my maternity leave and ready to share with you what we’ve been working on! 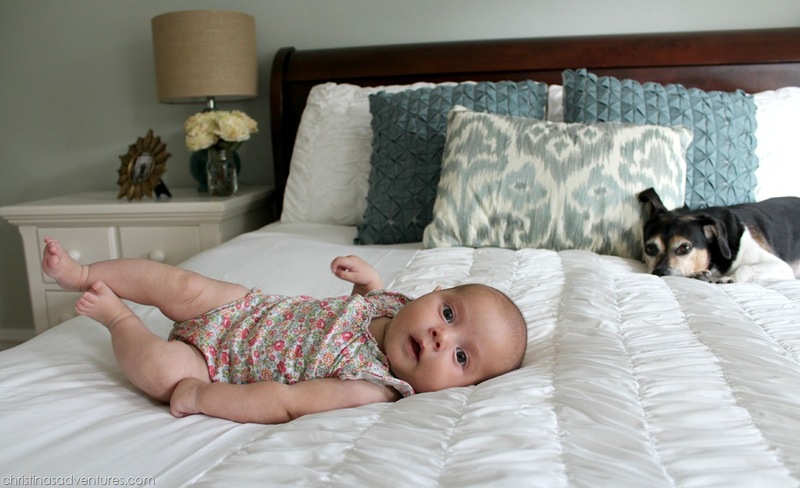 Between sweet baby snuggles and keeping up with an active toddler this summer, we’ve been working hard at our master bedroom. It’s finally done, I’m in love, and I can’t wait to show you these pictures! 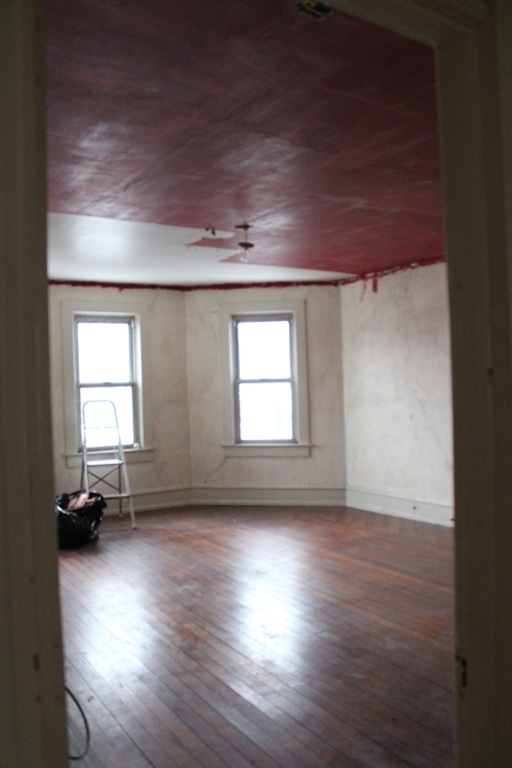 And this is what it looked like mid-renovations (oh, hello RED CEILING). Thank goodness that’s been taken care of! I just LOVE our bedroom now! We have had this bed frame (a wedding present from my in-laws) since we got married 7 years ago. 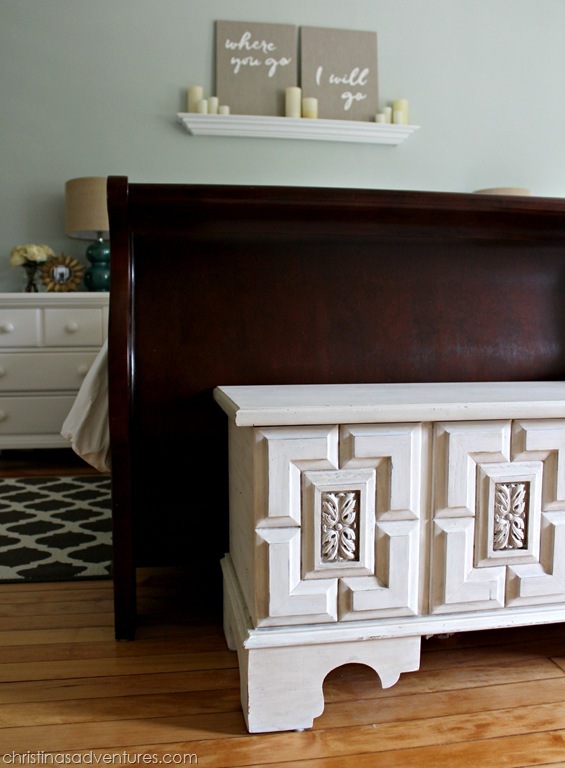 We never had “real” nightstands until now, and we are loving these new nightstands! In a room where we needed to get creative with storage (more on that later in this post), these nightstands are so heavily used. We’re thankful for all of the storage space they provide! Another way we got more storage was to use this old chest that I made over many years ago (don’t judge the pictures – it was back in the stone ages of blogging!) It was free – I trash picked it when someone from my work told me they had an old cedar chest sitting in their garbage – you know I ran to scoop it up! I’ve been trying so hard to make my bed every day. Usually it doesn’t happen until naptime, but I’m trying to add this simple discipline into my every day life! And part of making that bed is to put the “special pillows” on it everrrry day. 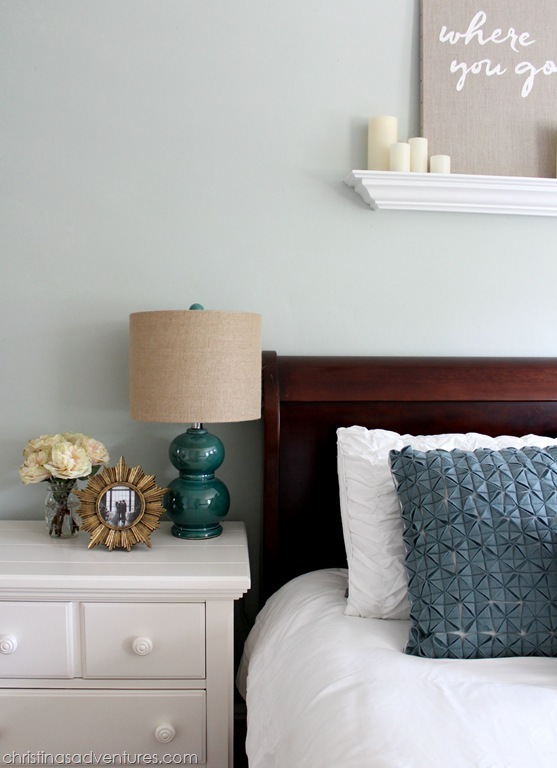 It’s part of making our bedroom that relaxing place at the end of the day – there’s something about pretty pillows on a made bed that just makes me so happy! 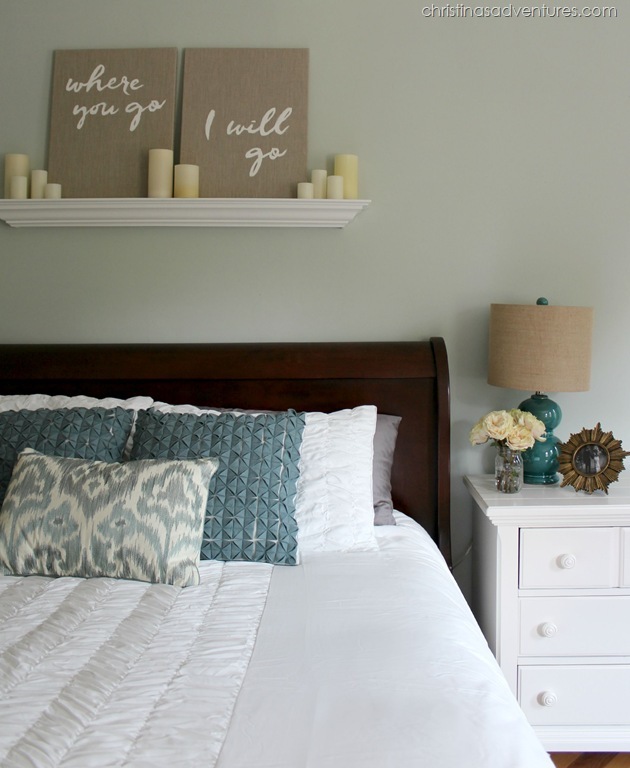 Seriously – this spot will be so loved for so many years in this bedroom! One of my other favorite elements of this room is what we put above our bed. I was going to ask my husband to make us a shelf, but he didn’t seem to enthused about that idea. And honestly? He’s been working SO hard on our house, I bought this shelf to surprise him. He was SO happy he didn’t have another thing added to his long to-do list! The canvases were an easy DIY project. I bought those stretched linen canvases on clearance ($4 a piece) at Michaels. I found a font I like online, printed out the words I wanted, traced them onto the canvases and then filled them in with paint. I added some flameless candles for ambiance – once I get batteries in all of them, I will set them to their “timer” function so they will go on and off all at the same time every night. The phrase “Where you go, I will go” has such special significance to us. It’s from Ruth 1:16, and it was part of our wedding vows. I just love this reminder of our vows to each other right above our heads every night. 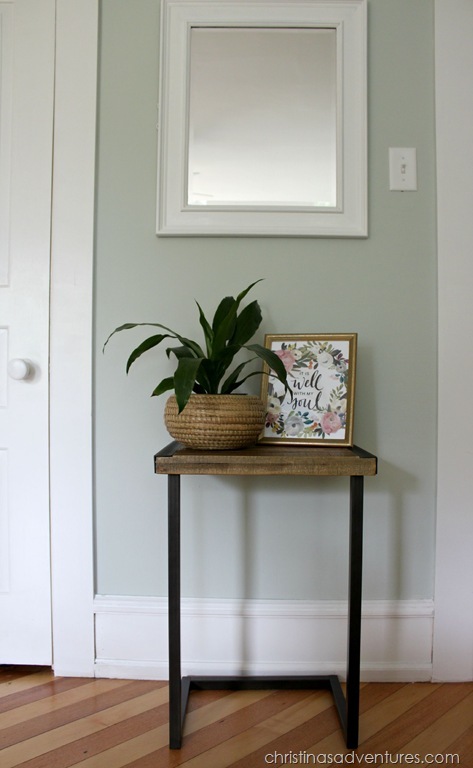 I filled in this blank space between two doors with this little table (it’s actually supposed to be a laptop desk, but I love it as an end table!). 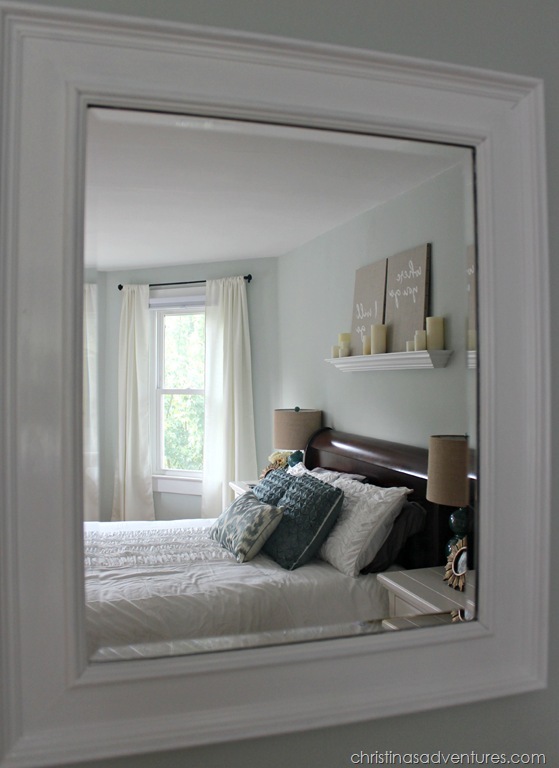 I added a printable (only $5 from this Etsy shop) and painted an old black mirror white to match all of the trim. 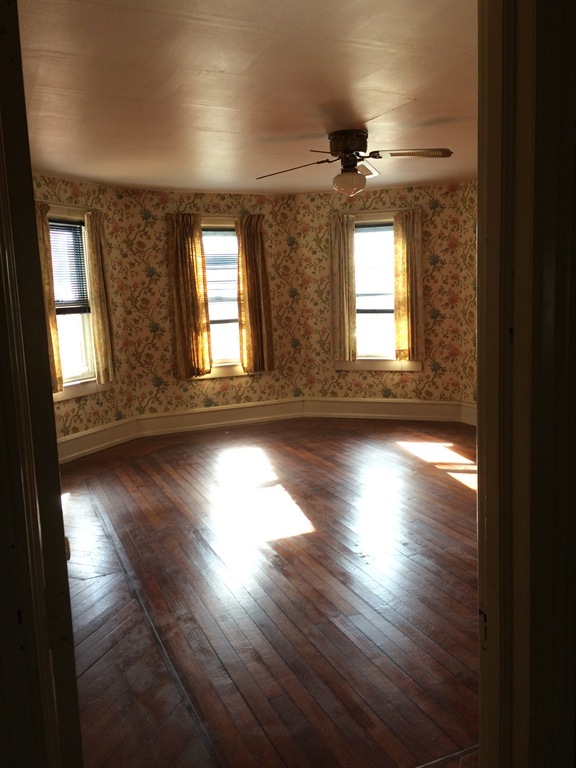 We haven’t changed too much of this house structurally, but we did change this room. The original room only had one small “closet”. Even though I worked at purging a lot of my clothes when we moved, we knew that wasn’t going to cut it. 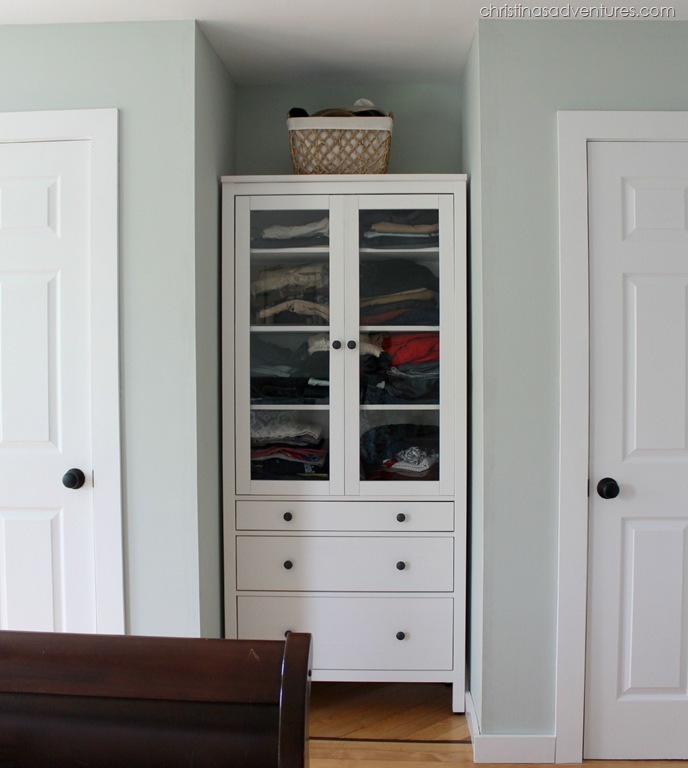 It took us a while to figure out, but we finally came up with a way to inexpensively give us a whole lot of storage space without compromising too much of the room. In case you can’t tell, I LOVE this space. 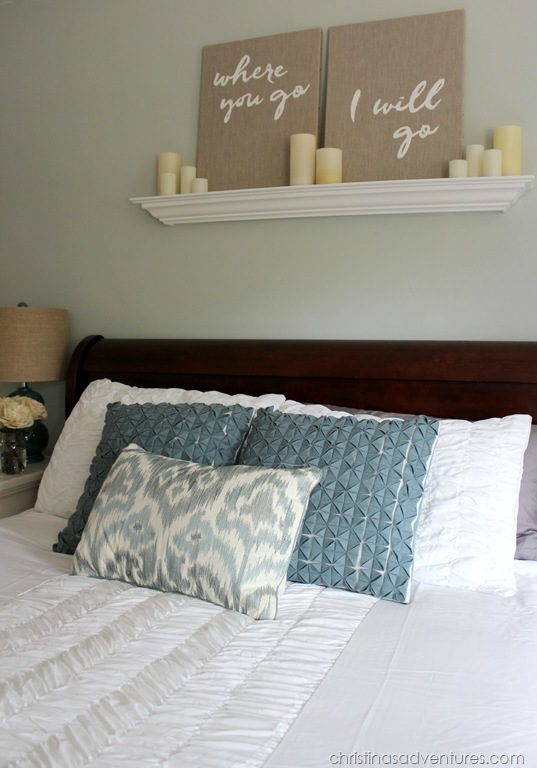 It’s exactly what we were wanting in our master bedroom & more! I am so thankful to Raymour & Flanigan and BeddingStyle.com for providing me with products for our master bedroom. As always, all opinions are 100% my own. This post also contains some affiliate links. Full disclosure here. Totally LOVE this new space. 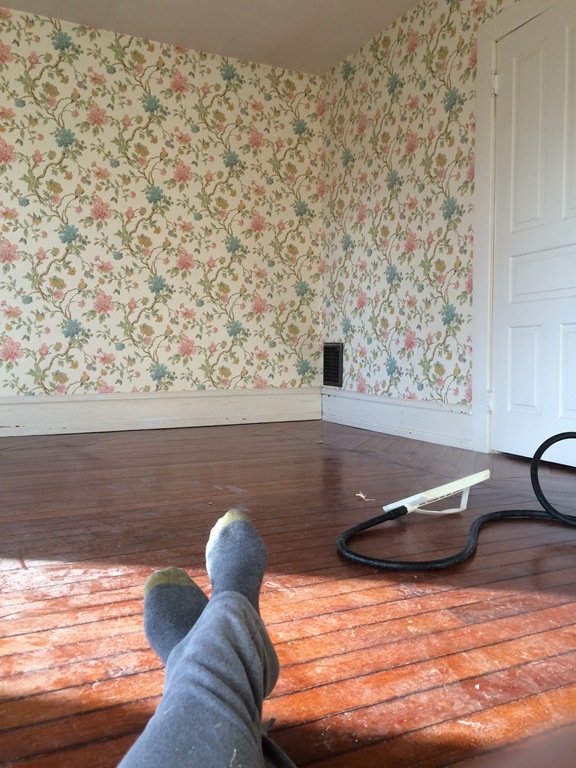 You have done a fantastic job on this room! 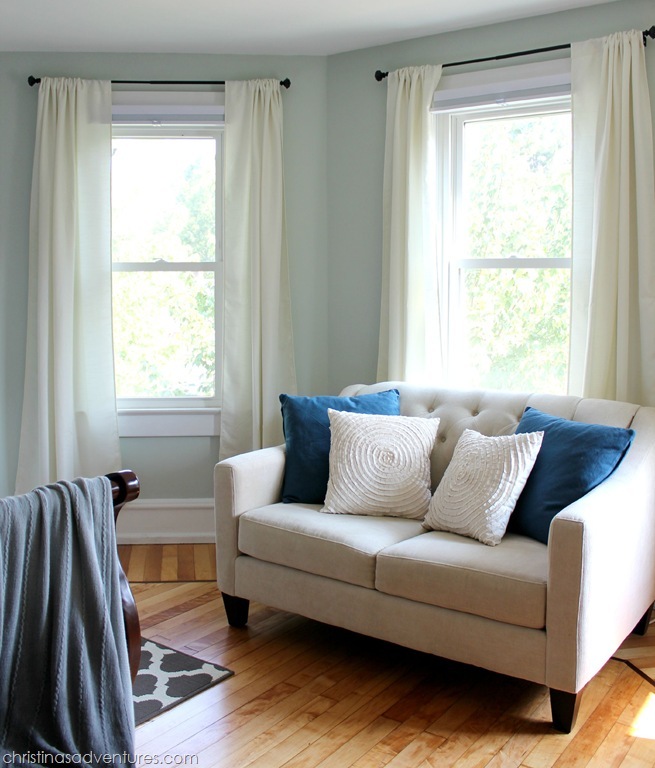 Love the colors and how light, airy and clean everything looks. It is such an awesome transformation! I wouldn’t change a thing..it’s perfect! 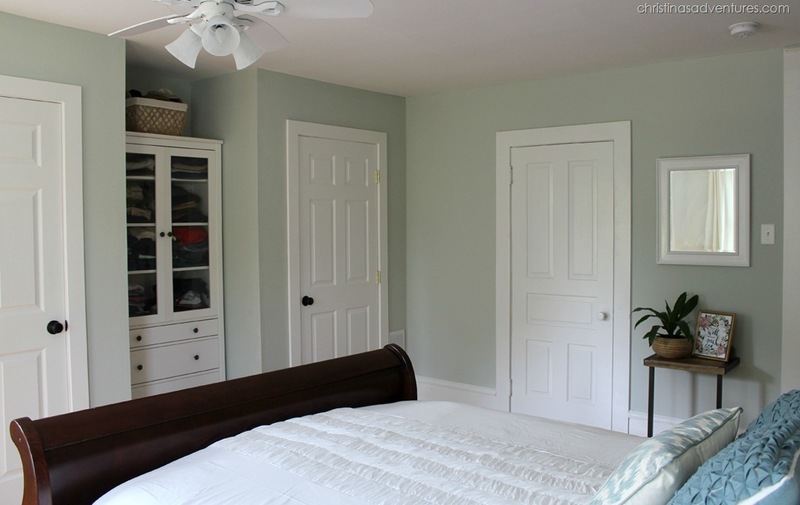 Please cover the box spring with a beautiful sheet. It can be solid or printed. The room is very pretty and fresh. Your room is absolutely beautiful!!! I love how relaxing you made it for your family. 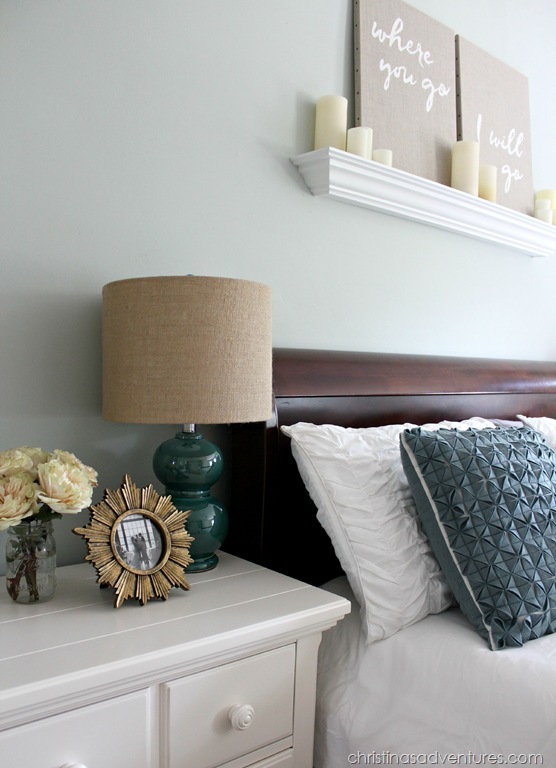 My husband and I are fixing up our bedroom….finally lol. 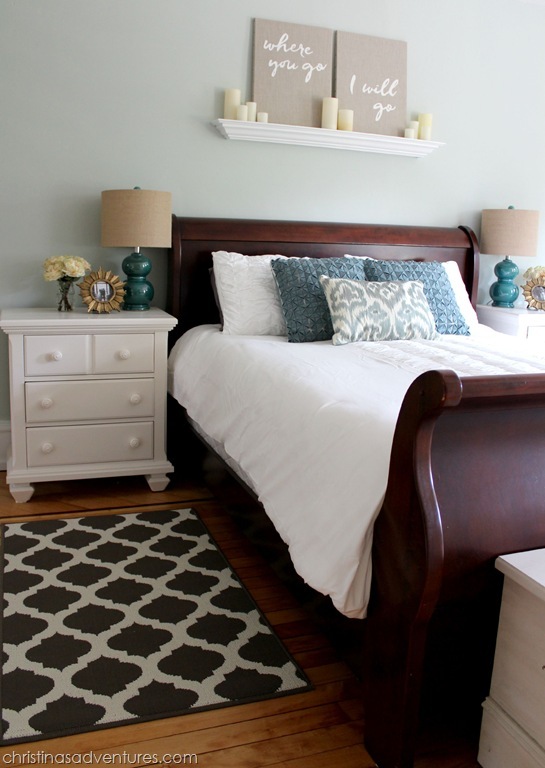 What color is the sleigh bed? What model is the bed? I’ve been looking all over for one like yours. Love your room! It looks so cozy and inviting. Do you know where you got the lamps? I’ve been searching for some for our bed room. What is the font you used for the pics? I love your bedroom and am going to SW to purchase my paint today. Can you let me know what color you painted your ceilings? I also love your sitting area, we got a loveseat also, that’s practically the same, just a different color. 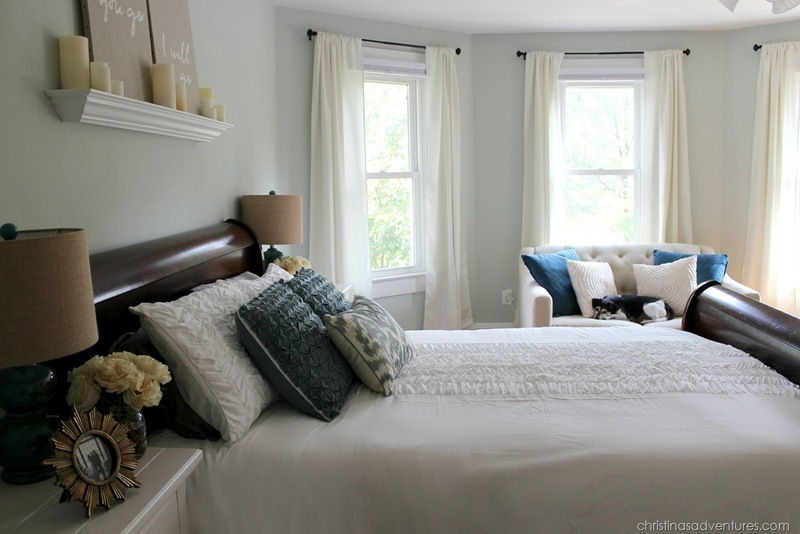 I love the composition of the pillows, and the overall look, and want to create something similar. (2 Bigger pillows with 2 small ones on top) . 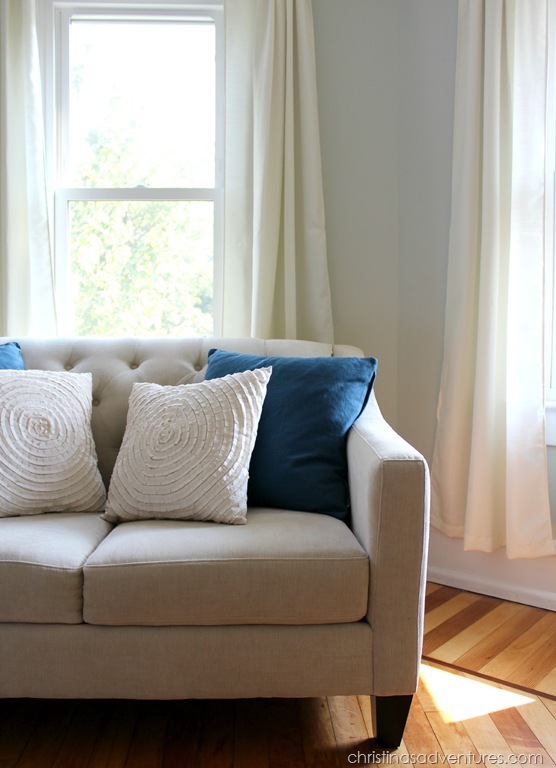 Can you give me the measurements of both the blue and the white Ross pillows on top? That would be awesome! Thank you, I wish you all the best for your beautiful family, may God continue to bless you, a warm aloha from the island of Hawaii 🌸, Eline. Love it! 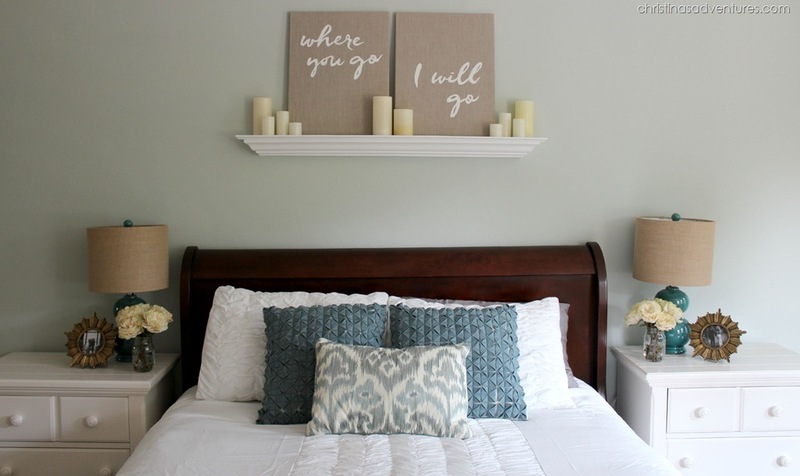 Where did you you get the “Where You GO” ” I will Go” prints above your bed?? Ahhh Thanks so so much! Can’t wait for the tutorial.